The public’s memory is very short. The panic of near economic collapse 10 years ago is all but wiped from public memory two weeks before the Nov. 6 American national election. We publish the following chapter from Be Still! Departure from Collective Madness (2017, Wipf & Stock), which first appeared as a guest column on MinnPost.com September 10, 2009. Perhaps the line from John Irving’s The Hotel New Hampshire in which “Sorrow,” the stuffed family dog preserved by a taxidermist, floats to the surface of the lake after a plane crash, helps explain what is happening in America. Something dear to the American family died in September/October, 2008. Prior to the series of chilling events of that period, most of us had lived with the illusion of relative economic and financial health. Then, suddenly, Sorrow was rushed to the emergency room for government resuscitation. Since then our memories of that pre-October 2008 world have taken a turn that families often take at funerals when the eulogies bear little resemblance to the reality of the deceased. We’re quarreling over what was real and what is mythical reconstruction. Following the plane wreck that takes the lives of the Berry family parents in Irving’s The Hotel New Hampshire, the stuffed family pet bobs to the surface of the lake, floating among the wreckage. Sorrow floats. So does the thing we lost last fall. What died last year was the ruling assumption that an unregulated free-market system was the best way to organize an economy and that laissez-faire capitalism is democracy’s natural ally. The market almost crashed. It didn’t crash only because the federal government intervened to prevent a repeat of the crash of 1929. Sometime between mid-September and October seventh, when Congress passed its bill to stabilize the financial markets, the myth of the virtue of deregulated capitalism died. It was stuffed by the taxidermy of government intervention, but it still floats. When a conviction or a myth dies, it doesn’t go away. It continues to bob to the surface. Sometimes, as in the case of the Berry family, the old dog is much easier to love after it is dead. Sorrow—obese, lethargic, and persistently flatulent in its old age—no longer waddles through the dining room to foul the air and ruin everyone’s dinner. In the public psyche, the unpleasant memories of the real life Sorrow give way to the stuffed Sorrow, a thing of nostalgia that lives on . . . even after it’s dead, and long after the plane has crashed. Sorrow and its old illusions float every time the reconstructed memory, forgetting the real Sorrow, barks about “socialism.” Sorrow floats every time we shout each other down in town-hall meetings. Sorrow floats every time nostalgia forgets that it was only by government intervention with our tax dollars that Sorrow is still around. Sorrow floats every time we forget the voracious appetite, unscrupulous predatory practices, insatiable greed, and the obesity that led to the deaths of Lehmann Brothers, Merrill Lynch, and Bear Stearns, not to mention insurance giant AIG and all the banks that had taken the plunge into a market of deregulated derivatives and mortgages that led to the epidemic of home foreclosures, bankruptcies, pension-fund collapses, and job losses. Sorrow, the old dog that failed us, still floats and still barks a year after the crash when the mind forgets and nostalgia remembers a system we thought was working in our interest. Old ideas and convictions die hard. The powerful economic forces that grew fat during the years when government was viewed as the people’s enemy will stoke the fires of public anxiety and anger, taking advantage of the floating Sorrow that reminds us of something that we love more in retrospect than we did the day it died of its own obesity. Gordon C. Stewart, Chaska, MN, October 21, 2018. The Congressional omnibus budget bill is a compromise – a BIG compromise. It turns the clock back on regulations put in place after the financial market meltdown in 2008 had taken us to the brink of another Great Depression. It undoes the core provision of Dodd-Frank and increases the limit for wealthy giving to political campaigns. 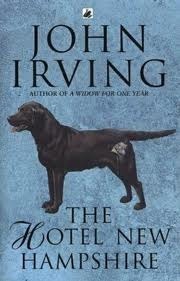 Cover on John Irving’s The Hotel New Hampshire in which “Sorrow” the family dog floats to the surface after the plane crash. The dog we hoped we’d buried still floats, as Views from the Edge published on MinnPost a year after the 2008 crisis. Click Sorrow Floats: the Healthy-Deregulated-Capitalism Myth Just Keeps Resurfacing. Sorrowfully, memory is short, and, because the American electorate chooses amnesia to consciousness, the old dog still haunts us. “Sorrow floats.” Perhaps the line from a John Irving novel — in which “Sorrow,” the stuffed family dog preserved by a taxidermist, floats to the surface of the lake after a plane crash — helps explain what is happening in America. Something dear to the American family died one year ago last September-October. Prior to the series of chilling events of that period, most of us had lived with the illusion of relative economic and financial health. Then Sorrow was rushed to the emergency room for government resuscitation. Since then our memories of that pre-September 2008 world have taken a turn that families often take at funerals when the eulogies bear little resemblance to the reality of the deceased. We’re quarreling over what was real and what is mythical reconstruction. Following the plane wreck that takes the lives of the Berry family parents in Irving’s “The Hotel New Hampshire,” the stuffed family pet bobs to the surface of the lake, floating among the wreckage. Sorrow floats. So does the thing we lost last fall. What died last year was the ruling assumption that an unregulated free-market system was the best way to organize an economy and that laissez-faire capitalism is democracy’s natural ally. The market almost crashed. It didn’t crash only because the federal government intervened to prevent a repeat of the crash of 1929. Sometime between mid-September and Oct. 7, when Congress passed its bill to stabilize the financial markets, the myth of the virtue of deregulated capitalism died. It was stuffed by the taxidermy of government intervention, but it still floats. When a conviction or a myth dies, it doesn’t go away. It continues to bob to the surface. Sometimes, as in the case of the Berry family, the old dog is much easier to love after it is dead. Sorrow — obese, lethargic, and persistently flatulent in its old age — no longer waddles through the dining room to foul the air and ruin everyone’s dinner. In the public psyche, the unpleasant memories of the real life Sorrow give way to the stuffed Sorrow, a thing of nostalgia that lives on … even after it’s dead, and long after the plane has crashed. Sorrow and its old illusions float every time the reconstructed memory, forgetting the real Sorrow, barks about “socialism.” Sorrow floats every time we shout each other down in town-hall meetings. Sorrow floats every time nostalgia forgets that it was only by government intervention that Sorrow is still around. Sorrow floats every time we forget the voracious appetite, unscrupulous predatory practices, insatiable greed, and the obesity that led to the deaths of Lehmann Brothers, Merrill Lynch and Bear Stearns, not to mention insurance giant AIG and all the banks that had taken the plunge into a market of deregulated derivatives and mortgages that led to the epidemic of home foreclosures, bankruptcies, pension-fund collapses and job losses. Sorrow, the old dog that failed us, still floats and still barks a year after the crash when the mind forgets and nostalgically remembers a system we thought was working in our interest. The Rev. Gordon C. Stewart is pastor of Shepherd of the Hill Presbyterian Church in Chaska. He is the moderator of Shepherd of the Hill Dialogues and former executive director of the Legal Rights Center. The views expressed in this article are his own and do not represent the views of anyone else.